Drive-in rack can be configured to store loads three, four or more deep, creating extremely dense storage. 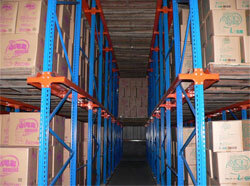 A drive-in system that stores pallets four high and five deep, for example, can hold 20 pallets in each bay. In a drive-in system, lift trucks drive into the front of a storage bay, place a load in the desired position and then back out. To allow lift trucks into the bays, drive-in systems are designed without traditional beams placed across the bays. Instead, pallets rest on rails that run along the insides of the bays, perpendicular to the aisles. 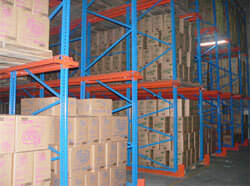 Pallets in a drive-in racking system are stored on a last-in/first-out basis. Each bay is typically dedicated to a single product, so drive-in rack is best used in warehouses storing large quantities of the same product. Drive-in systems severely limit access to products stored in rear positions. As a result, say experts, this type of storage is best suited for situations in which an entire bay of products would be moved at once, such as in staging products for shipping.